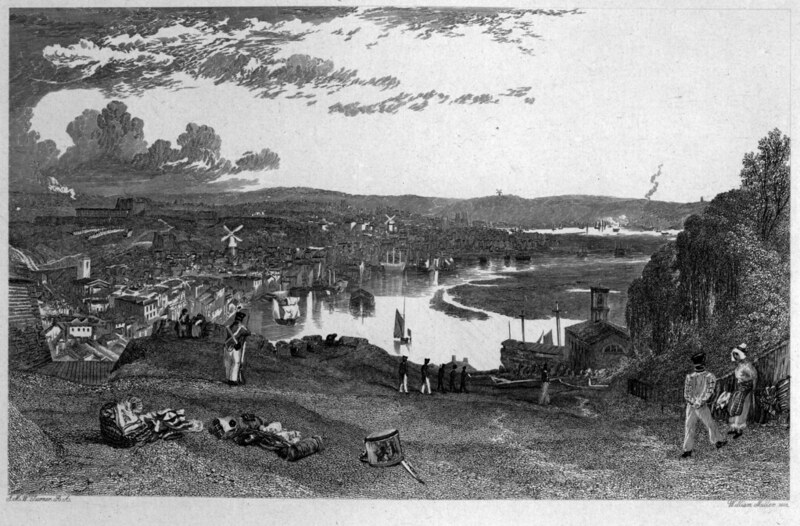 "Chatham, open etching by William Miller after J. M. W. Turner, published in Picturesque Views in England and Wales. From Drawings by J. M. W. Turner, engraved under the superintendence of Mr. Charles Heath with descriptive and historic illustrations by H. E. Lloyd. London: Longman, Orme, Brown, Green, and Longmans, 1838". Overall view and closer crop of the area in question showing the mill, with a second mill further along (bottom of Star Hill?). The engraving seems to suggest the mill had a circular base, though I do not know how accurate the engraved copy is. I believe Turner did his sketching for these images in the 1820s and then published the finished paintings c.1830, and that he used a certain amount of artistic licence. Looking at this picture smiffy posted in another thread, showing a similar view to the photo c.1830, the windmill is clearly visible. It certainly seems to be in the same position as the roof I mentioned in my previous post (hard to tell if it is round, oval square or rectangular for sure, but it looks to have a slight curve to me). This would seem to confirm the mill was demolished sometime in the period 1830-1860, rather than 1890 as mentioned in Finch's book. P.S. I think smiffy is absolutely right and the chimneys are actually part of the Best Brewery located where Manor Road is now. I think the cluster of chimneys is part of Bests Brewery, leofwine. I can't determine if the windmill had a circular or square base - if it was circular I would think it would show up even easier on the map. "The case of the disappearing windmill"
Looking at the cluster of tall chimneys in the middle of the picture I'm wondering if it might have been replaced with a steam mill, perhaps with just the remains of the base of the old windmill nearby? And is the roof immediately to the right of the chimneys the (presumably) circular "roof put on the base" of the old windmill. If this is the case it proves the mill was demolished much earlier than the 1890 date given. Thank you linyarin, this means it should be clearly marked and visible on the 1865/66 OS, but I can't see it. I've had a look at the 1898 OS but still can't precisely determine where it was. 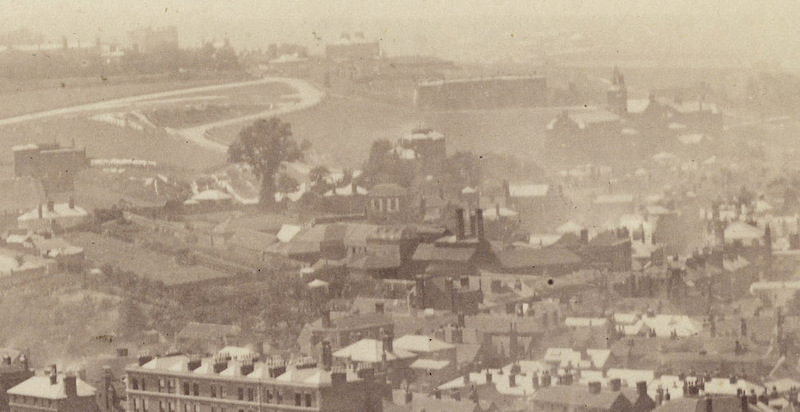 It should be somewhere near the centre of this cropped photo, taken probably late 1860's. Extract taken from 'Watermills & Windmills' by William Coles Finch. New Road, Feather Mill* 1 furlong W. of St. Bartholomew Church. Base shown on 1898 Ordnance Map. 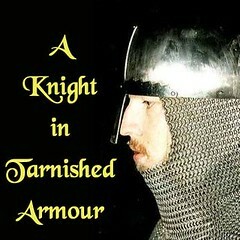 In Ireland’s History of Kent, Vol. IV, page 439, there is a print of Chatham Dockyard from Fort Pitt and in it, as in other prints of the period, a windmill is shown, in the direction of New Road, poised high upon a substantial brick base. I learn from John J. Freeman that his parents frequently spoke of the mill in New Road, and he knew the site, fixing its position by the fact that it stood in line with the Chest Arms Hotel, now the site of the Empire Theatre. The present garage of the Empire is the site of the Chest Arms Tap at Chest Arms Hard, where the boats from the shipping in the Medway ran ashore, The Tap was the rendezvous of the common seamen, and the Hotel for those 'superior' persons who joined the townsfolk in their carousal. From all I could gather, it was indeed a rough spot, but it is well to leave what that meant to the fertile brain of those versed in the history of such ports, say, a century ago. The point of interest here is that, in coming ashore and traversing the road that still leads to the High Street, at the side of the Empire Theatre, one could not have failed to see the old mill, perched high up on the bank in New Road. Pursuing my enquiries further, I found a lady who, when a girl, some seventy years ago, daily went past this mill on the way to school, and she referred to it as being a ‘Feather Mill/ I then recalled that, many years ago, I casually learned that the mill was used for preparing feathers for domestic use—beds, pillow-cases, etc.—but I cannot remember the authority, and my friend Freeman had never heard of the suggestion. On tracing the actual site of the mill with the help of the 1898 Ordnance Map, on which the remaining brick base was noted, I find the mill stood at the back of No. 46 High Street, mid-way between the High Street and the New Road, exactly as described by my friend Freeman. These premises are in the occupation of Mr. Horace H. Joyce, who not only assured me of the correctness of the discovery but also called my attention to the remains of the large, high, brick structure, with the decayed timber plates which had carried the floor stages of the basement of the mill. I understand that the mill had stood for many years without its sweeps before being pulled down about 1890 and a roof put on the base. possibly the one located at Chalk Pit Hill? Does it show up in any of the censuses? I've been trying to find out something about the Feather, or New Road Mill in Chatham. It is easily visible on some prints showing views of Chatham from the early 19th century, but the only records that I can find simply state that it was built before 1851 and demolished around 1890. That being the case, it should be clearly marked on the OS maps covering this period. As it stands I can find no trace of it on any map, even the highly detailed town maps from the mid 1860's which I have used here. The map reference given is the general area shown, the actual location I believe was to the rear of 46 High Street which I have marked in blue. As can be seen there seems to be no evidence that it was here at this time, and there is also a panoramic photograph from about 1860 covering this area that also shows no sign of it. I can only conclude that it was demolished sometime before c.1860 and not 1890 as listed.